Born in Aveiro, Pedro completed the Professional Course in Strings and Keys (Piano) with Fausto Neves at Escola Profissional de Música de Espinho in 2010. He is currently studying at the School of Music and Performing Arts of Porto with Pedro Burmester. At the same time he studies singing with professor Dora Rodrigues at the University of Minho. 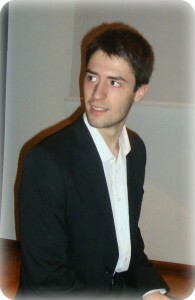 In 2008, he won the 2nd prize in the National Piano Contest of Guarda. In 2009, he participated in the International Piano Competition of the City of Guarda and achieved the 3rd position in the Young Musicians Award in the category of Chamber Music. He has participated in piano master classes with Álvaro Teixeira Lopes, Luiz de Moura Castro, Paulo Oliveira, Pedro Burmester, Luísa Tender, Vlad Dimulescu and Zoltán Kocsis, and chamber music master classes with Ludovico Tramma and Fiammetta Facchini. He is a member of Cappella Musical Cupertino de Miranda, Ensemble Vocal Pro Música, Coro Cappella Duriensis and Coro Casa da Música, having already worked under the direction of conductors such as Paul Hillier, James Wood, Jonathan Ayerst, Kaspars Putnins, Christoph König and Peter Rundel.